I am a bit slow to the whole escape room phenomenon, but it seems like a great idea to me. While I am not a computer gamer, I have run sites with that editorial content and know many professional gamers as a result. I am also a big Sudoku and crossword fan, having done those puzzles for more than a decade. The idea, if you are still not tuned in, is to bring a few friends to a facility and try to escape from a locked room within an hour. You have to solve various puzzles. Actually, you have to find the clues and then figure out the puzzle, without a lot of guidance. If you haven’t ever done a room, you first have to be very observant, looking at what objects have been placed in the room, what information is written on the walls or displayed on various monitor screens, and what objects might lead you to other things. For those of you that don’t like solving puzzles, this is probably not something you are going to like. If you do like puzzles, or if you go to haunted houses every fall (or even build your own), this is probably something you have already checked out. While I am not a computer gamer, I recognize that many years ago I spent weeks of my life trying to solve the puzzles of Myst. Back then, I said that “Myst starts out a total puzzle, and as you gain skills and understand the sequence of play involved, you get drawn into the universe of the game and lose track of real life and elapsed time.” You can say that about many modern computer games too. The problem with this is that you only have an hour to escape your particular room, and you don’t know how many puzzles you will have along your journey. The site has teams of reviewers in LA, Chicago, New York, Kansas City, Denver and Toronto, which is where they began four years ago. They have reviewed more than 400 rooms in North America. There are other sites that have reviews, but not as well organized or as consistent in their evaluations as ERA, as they call themselves. The site doesn’t pay their reviewers, but usually the room operator comps the reviewers to do the room. 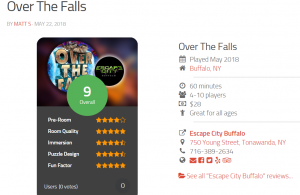 Many of his reviewers have played 50 or more rooms during their tenure, and Wood himself has lost count but thinks he has been party to at least 180 room reviews. He told me based on his experience that he doesn’t think the escape room craze has peaked yet, and there are still new rooms being built. One opportunity is to try to attract more corporate customers, who use the room as a team-building exercise. And part of that effort is what motivated the founders to start ERA, so that corporate customers could find the best rooms in a particular location. One of the reasons I like the ERA site is that it attempts to have consistent review metrics for all of its room reviews. The teams from the various cities met earlier this year here in St. Louis to try to iron out consistent style and to set up minimum requirements for their reviews. The reviewers also try to take into account a wide range of puzzle solving ability in their write-ups. Each room is done by at least three different people, who then collaborate on the review, and they usually agree on their evaluation. Having been to so many rooms, Wood told me that the average Canadian rooms are smaller and more suitable for 4 to 6 people, whereas in the States, they can hold more participants. Also, in Canada, you usually book a room exclusively for your own group, even if it is smaller than the room capacity. In the US, your team is sharing the room with others if the demand is there. If you have particular room experiences and want to share them with my readers, please post a comment here.